Ecotone Products: Rheem Marathon Water Heaters Back In Stock. 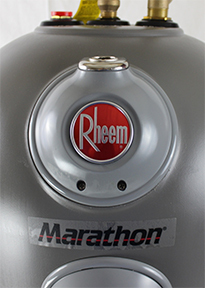 Most popular Rheem Marathon water heater models are becoming available again for coop utilities and contractors as supply shortages ease up. Ecotone Products, the largest wholesale distributor for Rheem Marathon electric water heaters in the Pacific Northwest, is continuing to build up its inventory on durable Rheem Marathon water heaters. The most popular 50 gallon Marathon water heaters (MR50245) are back in stock with ample supply to support regional cooperative utilities and contractors in providing energy efficient and durable electric water heaters to consumers. The mid-sized 85 gallon (MR85245) and the large 105 gallon (MR10245) Marathon water heaters are expected to be fully available by mid-February, 2014. Ecotone Products customers can expect to see any backorders on these products to be filled by the end of February. Ecotone Products continues to observe a robust demand for Rheem Marathon water heaters due to their unique construction and durability. All Marathon water heaters are built by using cross-fiber polybutene, which creates a significantly stronger water heater tank than conventional steel tanks. Homeowners using well water as a water supply at home often have a strong preference towards Marathon water heaters. Normal water heater tanks may only last 5 years when exposed to water with high mineral content. The minerals often cause steel tanks to corrode at an accelerated pace. The non-metallic tank construction of Marathon water heaters makes the tank impervious to rust and corrosion. Rheem backs up the quality of the Rheem Marathon heaters by providing a limited lifetime warranty against leaking tanks. All Marathon water heaters also feature upgraded titanium plated super-sized electric water heater elements. The titanium plating and the larger sized elements prolong the life-expectancy for Marathon water heaters. Titanium reacts at a much slower rate with minerals naturally occurring in the water supply than standard copper or steel elements. Similarly, the larger water heater elements allow for a less strenuous even transfer of heat between the heating elements and the water minimizing the wear and tear on the element. Ecotone Products carries a wide selection of Marathon water heaters in stock. Factory trained Ecotone Products staff is available discuss your Rheem Marathon water heater needs via email and phone Monday through Friday, 7AM-5PM PST.